I began weight training in 1994-95 and am still passionate about it, many years later. My interest in weight training and bodybuilding pre-dates this website by about seven years. 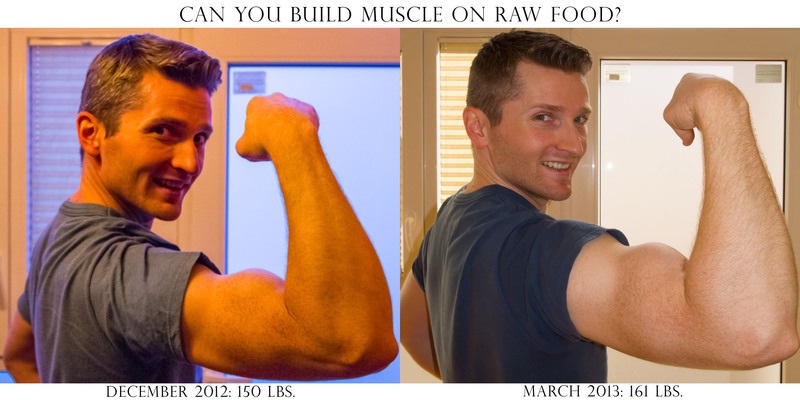 I am a raw foodist and I want to prove that you can build serious muscle on raw food. For me, raw food means a mix of 20-40% cooked vegan food, with the rest made up of raw vegan food and superfoods. My protein supplementation is about 75% raw vegan and 25% vegan. I’ll turn 37 this year and I want to prove that one can build muscle at this age and even beyond it. Last autumn, I started going to the gym regularly once more, with the specific purpose of building muscle. All summer long, I’d been exercising at home, using Arnold’s 1% Workout, getting my body ready for weights. And that’s one thing I’d like to stress right now: if you’ve been off weights for a while, years maybe, like me, you’ll need to get ready for weightlifting with a few months of bodyweight exercises. Don’t just go to the gym and start lifting, you’re asking for unnecessary inflammation, pain and potential injuries. From September to the end of October, I made great progress. My muscles started remembering their previous size and began to grow again. I was on my way to wonderful results, sooner than expected, until an unexpected injury sidelined me, right at the start of November. This was completely unrelated to bodybuilding. We were doing renovations at home, and the workmen had dug a trench in the garden to lay some new pipes. They forgot to tell me. We came back home at night from an out-of-town trip, I took a walk through the garden in pitch black darkness and fell right in. It was a strange feeling, stepping into a void… When my foot hit bottom, I heard a terrible crunch and then the excruciating pain began… The force of the impact pulled on my ankle ligaments so much that it fractured both the tibula and the fibula at their ends. (The medical term is bimalleolar fracture.) It snapped one of them clean off and the other managed to hang on. Let’s just say I have a nice zipper-shaped scar on my ankle and a couple of extra titanium screws in there. I’m thankful that the ligaments didn’t tear, because the recovery would have been more painful and would have lasted longer. 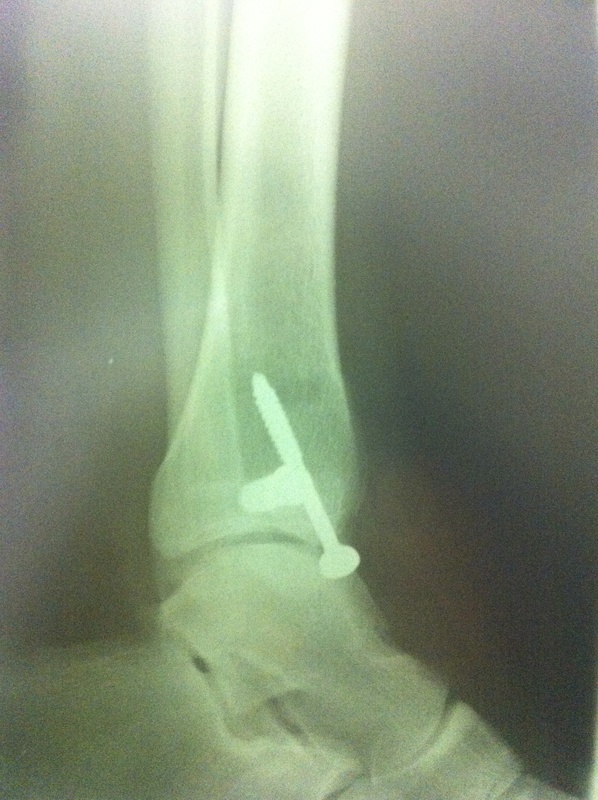 Here’s the x-ray after surgery. I was told to take it easy after the surgery, so two months of what would have been fruitful weight training went down the drain. I finally couldn’t take it any longer after the holidays and went back to the gym on crutches, hopping around on one leg from machine to machine, training what I could train without affecting my ankle. Things got better soon after that. I also went to physical therapy, did acupuncture and my ankle is almost fully healed now. There’s still some soreness in the mornings, some swelling still has to disappear but I can use it: I can do standing and sitting calf raises, I can walk normally and will soon be able to run and jump as well. It’s now March and I wanted to show you the progress I’ve made since the start of December. I do wish I’d have taken a photo of my body earlier, at the start of my weight training, but I didn’t. 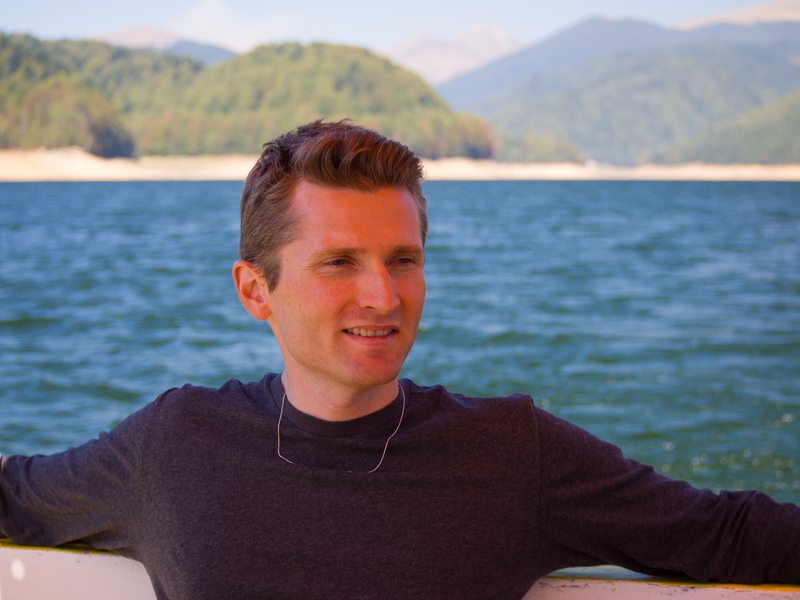 The best I can do is this photo, taken in September on a trip to Lake Vidraru. You can clearly see that I have little muscle mass and my arms are pretty thin. Now let me show you a much better example of my progress. Here you can clearly see that my arms are much thicker and my back is thicker, justifying the ~10 lbs. of weight I put on. And I can assure you that it’s all muscle; if anything, my body fat is lower now. This is only the beginning. I plan to add muscle mass until I get to 200 lbs. It’s not so far-fetched as you might think. In college, I went from a skinny ectomorph of 135 lbs. in my freshman year to a muscular mesomorph of 195 lbs. in my senior year. Granted, I did it on a traditional diet of meat, dairy, eggs and vegetables, but I know it’s also doable on raw foods. If I got to 195 lbs. once I can do it again and I can go beyond it as well. I can do it on raw foods and more importantly, I can do it without steroids or other illegal substances. My body is perfectly capable of secreting all of the hormones it needs, as it did so in the past and will continue to do so in the future. Wondering what my diet looks like? Here’s a peek. I may also do a workout video (or videos) in the future. thank you !!! as always super usefull!!! wow! what kind of trench was that… At least it is better than the prospective mother having fallen into it.